In this article we will examine our published research findings in 2014 and 2015 and the latest in medical research with two 2017 studies concerning atlantoaxial instability and the myriad of symptoms and challenges it creates for patients. In that research, our team suggested that the cervical capsular ligaments are the main stabilizing structures of the facet joints in the cervical spine and that they are a major source of chronic neck pain. The instability these injuries create often reflects a state of instability in the cervical spine and is a symptom common to a number of conditions including disc herniation, cervical spondylosis, whiplash injury and whiplash associated disorder, postconcussion syndrome, vertebrobasilar insufficiency, and Barré-Liéou syndrome. However, this hypothesis of ligaments being the underlying cause of chronic neck instability has little support in the medical community with respect to data correlating patient status with either repair-promoting treatments or documentation of regained stability. As we will see in the updated research below, cervical spine recommendations to treatment so often includes dangerous surgeries because the cervical neck problems are only seen by many health care providers as a disease of the vertebrae and discs, not the supporting structures including ligaments. New research is challenging this. Atlanto-axial rotational instability. The atlas is shown in the rotated position on the axis. 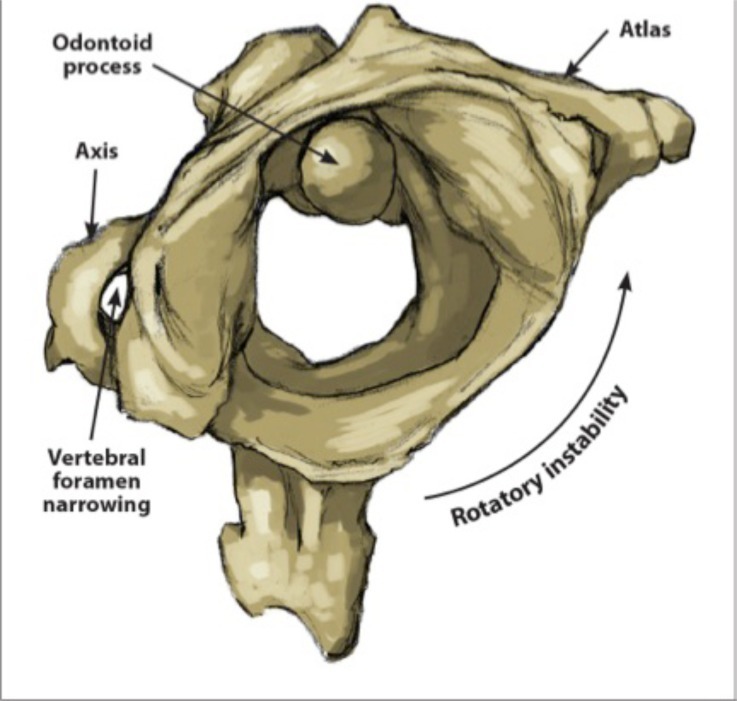 The odontoid process (the protruding bony process of the C2 (Axis)) and the transverse ligament are the most important structures stabilising the atlantoaxial complex. There is not a clear understanding how injuries of these structures contribute towards neck instability and a potential narrowing of the spinal canal. 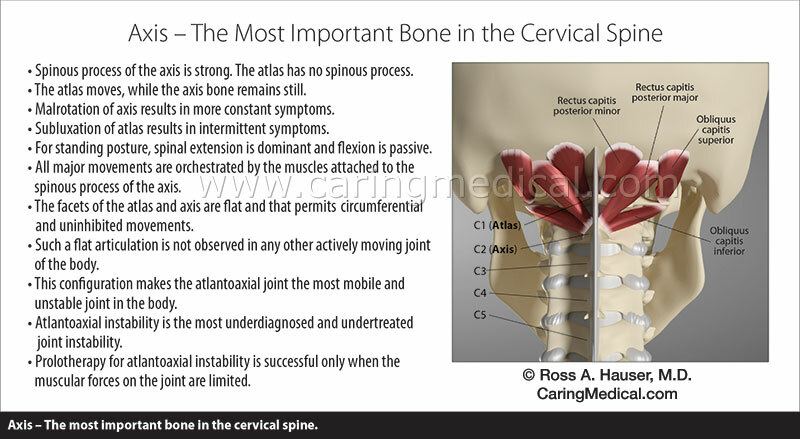 “Our results demonstrate that a relevant constriction of the spinal canal may be due to isolated or combined injuries of the bone and the transverse ligament. 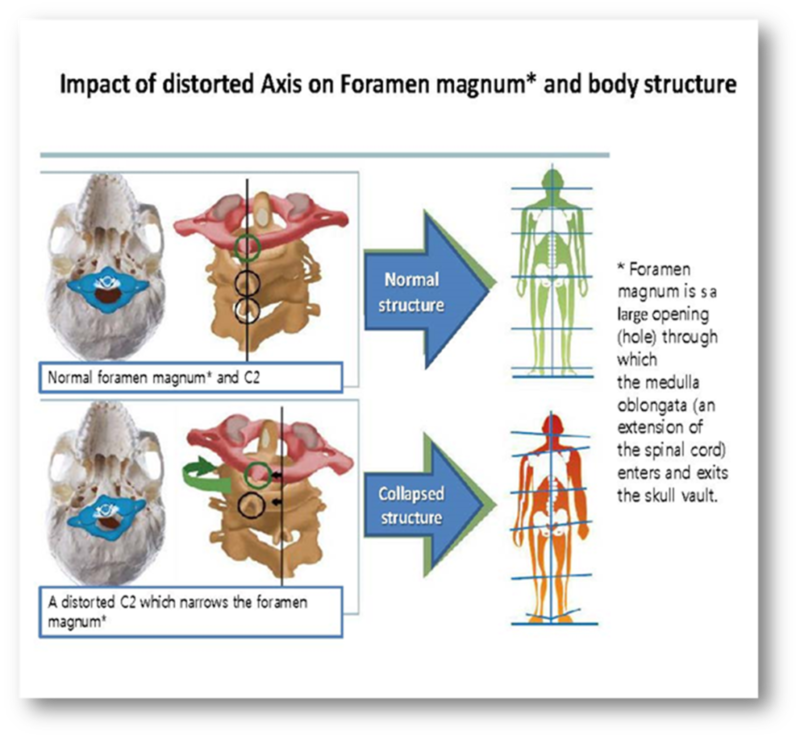 Furthermore, our results show the importance of posttraumatic immobilization of the spine with a view to the role of the transverse ligament for stabilization of the atlantoaxial complex.”(3) (Neck collars and other devices). Our comment: The doctors understand that ligament laxity is a problem of stability and range of motion in the neck. The effect of ligament laxity can be observed only on a macro level of joint motion and is lost once ligaments have been dissected and preconditioned for experimental testing. Our comment: It is hard on any level to accurately determine the amount of ligament damage to the amount of instability because even small injuries or damage, sometimes undetectable, cause big problems. As a result, although ligament laxity values are recognized to exist, specific values are not directly available in the literature for use in finite element models. Our comment: Ligament laxity is a mystery and why cervical neck pain patients have a difficult time finding the right medical care. Above is a sample of the handful of research from our office, German researchers and Canadian researchers who recognize the problems of cervical ligament damage in helping patients with atlantoaxial instability. This research is dwarfed by the amount of papers which deal with seeking out better ways to perform Atlantoaxial instability to limit complications, long hospital stays, and unsatisfactory outcomes. In 2015, Caring Medical and Rehabilitation Services published findings in the European Journal of Preventive Medicine investigating the role of Prolotherapy in the reduction of pain and symptoms associated with increased cervical intervertebral motion, structural deformity and irritation of nerve roots. 1 Hauser R, Steilen-Matias D, Fisher P. Upper cervical instability of traumatic origin treated with dextrose prolotherapy: a case report. Journal of Prolotherapy. 2015;7:e932-e935.